Education efforts, when focused on non-believers, tend to reinforce their views that climate change is either not real, is natural, is a conspiracy of scientists or is good for the planet. The reason for this fascinating but head scratching response is the great politicization of the perceived debate and is largely brought on by the propaganda of the $900 million annual funding umbrella of the climate change counter-movement (see here). This work compares the climate science beliefs of citizens, policy advisors and scientists who actively publish research on energy technologies in the U.S. Scientists and policy advisors are more likely to believe when compared to the public. When compared across the political spectrum, the public and policy advisors are more polarized in their views than scientists, with the more Conservative individuals believing less of the science. This backwards sounding reality is based on what is called false confidence. When an individual believes his or her knowledge is correct, unknowns cannot influence their thinking. It is basically the momentum of ignorance and is compounded by belief systems. Conservatives (in general) have less faith in science than others. When they are faced with science that is counter to their beliefs, it is difficult to get them to change those beliefs because of their preconceived notions of the validity of science. The findings in this work were that 64 percent of the general public believes global warming is happening, and 90 percent of energy scientists and 71 percent of policy advisors believe. The human-caused findings are 57 percent of the public, 80 percent of energy scientists and 70 percent of policy advisors. These researchers emphasize that the climate pollution conundrum is not just one of scientific literacy; it is a challenge of ideologies and belief systems. Conservatives tend to support business and not the environment, so anything environmentally oriented attacks their belief systems. These beliefs are fundamental and have contributed greatly to a distrust of earth scientists, and again—significantly motivated by the $900 million annual funding umbrella of the climate change counter-movement. 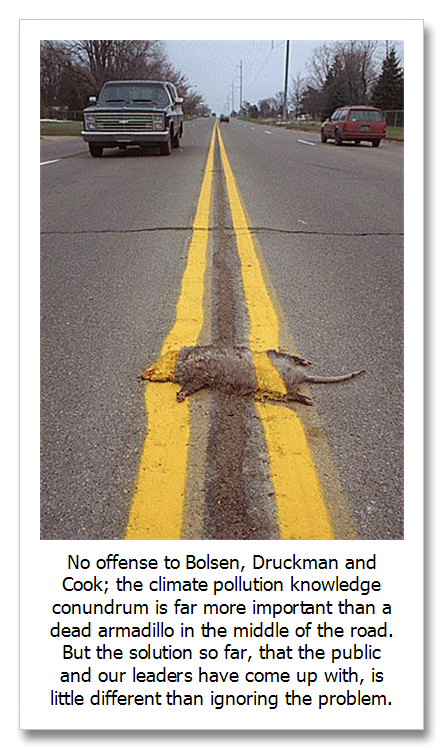 Bolsen Druckman Cook, Citizens, scientists and policy advisors beliefs about global warming, AAPSS, February 13, 2015. From 2003 to 2010, $7 billion in climate change counter-movement funding has been identified from revenues reported in IRS tax returns for 91 of 118 organizations and institutions identified in the academic literature as being involved. Brulle, Institutionalizing delay: foundation funding and the creation of U.S. climate change counter-movement organizations, Climatic Change, December 21, 2013.